FORT MYERS, Fla. (September 6, 2017) - A walk-off hit-by-pitch in the bottom of the ninth inning handed the Palm Beach Cardinals (2-0) a share of the 2017 FSL Championship. Their 3-2 win over the Fort Myers Miracle (0-2) gave them the sweep in the best-of-three series. The Cardinals plated a run in the second inning after putting the first two men on base against starter RHP Sean Poppen. Blake Drake bunted the runners over, and Shane Billings bounced a ball to third. Chris Paul gloved the ball with a chance to come home and cut down the runner but could not transfer the ball out of his glove. The throw went to first instead and Palm Beach took a 1-0 lead. The Cardinals added a second tally in the fourth when Jose Martinez doubled to left-centerfield to score Drake. RHP Connor Jones pushed through five scoreless innings in his start and allowed just one hit along the way. In the sixth, Tanner English led off with a walk and stole second base. Paul sent a bouncing ball to third with two outs that Leobaldo Pina booted, allowing English to score. Jones pitched to one batter in the seventh before he was taken out with a 2-1 lead. In the top of the eighth, RHP Derian Gonzalez struck out Tanner English before Nelson Molina came in to pinch hit for Kevin Garcia. Molina whacked a solo home run to right field to tie the game at two. After two scoreless frames in the seventh and eighth, RHP Tom Hackimer (L, 0-1) trotted out for the ninth. He issued a one out walk to Drake before Billings singled to put runners at the corners. The Miracle intentionally walked Martinez, and up stepped Thomas Spitz. Hackimer clipped Spitz on the left jersey sleeve to bring home the championship-winning run, a walk-off hit-by-pitch. RHP Hector Mendoza (W, 1-0) earned the win. The Miracle thank their fans for a tremendous season in 2017. We look forward to serving our fans during the 2018 season and encourage everyone to enjoy their offseason and STAY SAFE during the impending Florida storms. 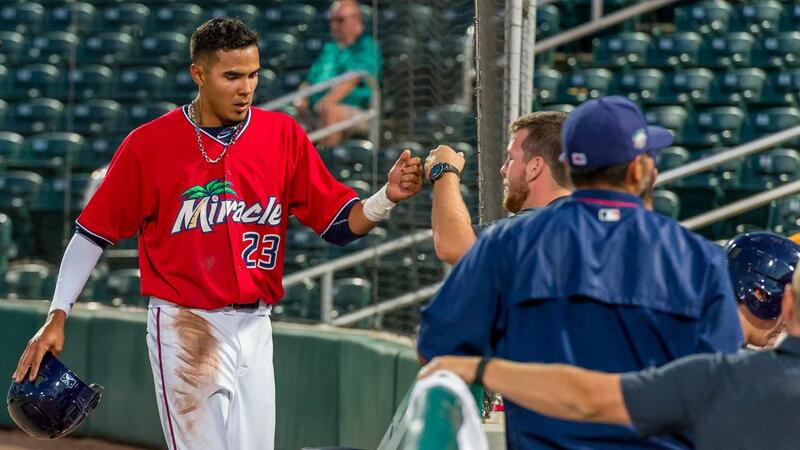 To stay up to date on upcoming promotional nights, follow the Miracle online at Miraclebaseball.com or through social media; Twitter: @MiracleBaseball, Instagram: fortmyersmiracle, Facebook: Fort Myers Miracle, Snapchat: ftmyersmiracle. To purchase tickets, visit MiracleBaseball.com/tickets. For further information or questions regarding the 2017 25th Anniversary Season, call the Miracle offices at (239) 768-4210.